When throwing a party that is serving alcohol this seems to be the number one question across the board...How much and what should I buy? You can always call our friend Dave Foreman of Pourmasters where they have bars, bartenders &/ or a delivery supply service for your party, but if for some reason you take on this task yourself then check out this handy dandy calculator. It's on that fun little website that we all like to use when planning an informal gathering: evite. 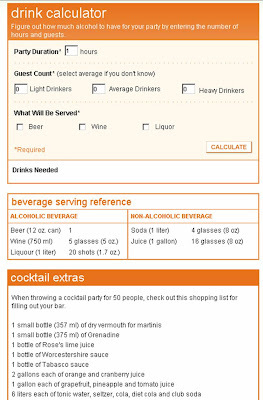 This calculator helps with a list of items to buy depending on the number of hours you plan on serving and the weight of heavy vs. light drinkers at your party. I haven't had the chance to use it yet but will as soon as I get the chance so I will let you know how it goes. If you use it yourself please let us know your feedback. We want to endorse things that work. Thanks to all and have fun at your next party!